The Maine Land Use Regulation Commission received a petition from the Plum Creek Land Company to rezone roughly 421,000 acres in the Moosehead Lake area in order to implement a concept plan. This article describes the Commission's concept plan program. 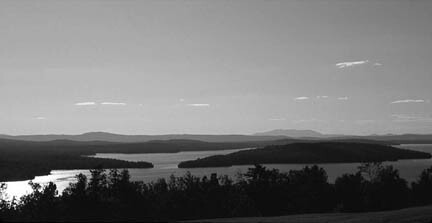 Looking west over Moosehead Lake. Photo © Jym St. Pierre. Concept plans are landowner-created, long-range plans for the development and conservation of a large area. These plans are a clarification of long-term landowner intent that indicate, in a general way, the areas where development is to be focused, the relative density of proposed development, and the means by which significant natural and recreational resources are to be protected. The Commission established the concept plan process as a flexible alternative to traditional subdivision and development regulation, designed to accomplish both public and private objectives. Concept plans are initiated by a landowner and must be approved by the Commission. The Commission's Comprehensive Land Use Plan describes concept plans in its discussion of the agency's lake management program. Concept plans are implemented by rezoning land to a Resource Plan Protection (P-RP) subdistrict. Consequently, the key regulatory review criteria for concept plans are the Commission's statutory criteria for rezoning and the Commission's Land Use Districts and Standards. Receipt of initial application. Upon receipt of the initial application, the application materials are made available for public inspection and review. Deficiency review and determination of acceptance of application for processing. The LURC staff performs an initial application content review and identifies any application deficiencies. The applicant has a chance to submit deficient information, as necessary. The application is mailed to various state and federal agencies for review and comment. The staff then determines whether the application is acceptable to begin the review process. Review of application by Commission staff. The LURC staff undertakes a detailed review and analysis of the application. This will likely include meetings with the applicant, state and federal review agencies, and others to clarify issues and request more information as needed. The staff may also engage independent consultants to gather information on issues that staff believes to be necessary and legally relevant. Public hearings scheduled. Once the LURC staff completes gathering and analyzing information and the application is deemed complete for processing, the Commission will begin its formal public hearing process. The public hearing process will enable the Commission to gather information and ask questions of the applicant and others who may choose to testify, and will allow the applicant and others the opportunity to address the Commission and answer questions. The public hearing process includes posting the proposal to public hearing, providing notice of public hearings in newspapers and to interested parties, deciding on petitions to intervene, holding pre-hearing conferences, and hosting one or more public hearings to gather official public testimony regarding the proposal. Commission decision. After the public hearings, the hearing record remains open for at least 10 days to allow persons to submit written comments, and for at least an additional 7 days for filing rebuttal comments. After that time, the public hearing record may be reopened by the Commission, as necessary. Once the hearing record is closed, the Commission makes a decision on the proposal. The Commission welcomes public comments on this proposal at any time until the public hearing record is closed. The deadline for comments will be established once a public hearing is scheduled. Send your written comments to the Commission's Augusta office (Maine Land Use Regulation Commission, 22 State House Station, Augusta, ME 04333-0022) or e-mail LURC@maine.gov. The Commission will provide opportunity for public scrutiny of the proposed concept plan during the course of its review. A formal public review and comment period will also be established as part of the Commission's review process. The Commission will host one or more hearings to gather oral and written testimony from the public about the proposal. If you wish to receive postal or e-mail notices about upcoming workshops, hearings and important deadlines related to the Commission's review of this proposal, contact LURC's main office in Augusta (call 207-287-2631or e-mail LURC@maine.gov). Please provide your name, postal or e-mail address, and daytime phone number and we will add you to a list of interested parties for this project. This article was published in the Fall 2006 edition of The Maine Woods, a publication of the Forest Ecology Network.